The SW Region Jr. Science & Humanities Symposium (JSHS) offers individual students from New Mexico, southwest Texas, and southern Colorado the chance to compete for scholarships and recognition by presenting the results of their original research efforts before a panel of judges and an audience of their peers. JSHS is a collaborative effort with the research arm of the Department of Defense and administered in cooperation with nationwide colleges and universities. 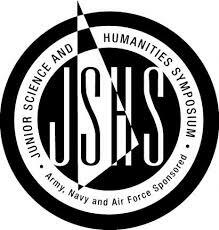 JSHS aims to prepare and support students to contribute as future scientists and engineers -- conducting STEM-H research on behalf of or directly for the Department of Defense, the Federal research laboratories, or for the greater good in advancing the nation's scientific and technological progress. Students apply online and provide their research plan & abstract. Those submissions are initially vetted for compliance to competition rules around format and content of documents submitted. Submissions moving on then require students to submit their technical paper and PowerPoint slide deck at a specified date prior to on-site competition. At the event, participants do an oral presentation of their project using their slide deck in front of a panel of judges in the first round. The top 10 presenters are identified and they present orally in a final round.